With lucidity and verve, expert knowledge and incisive analysis, Joel Bakan unveils the history and the character of a devilish instrument that has been created and is nurtured by powerful modern states. Eminent Canadian law professor and legal theorist Joel Bakan contends the modern business corporation is created by law to function like a psychopathic personality. 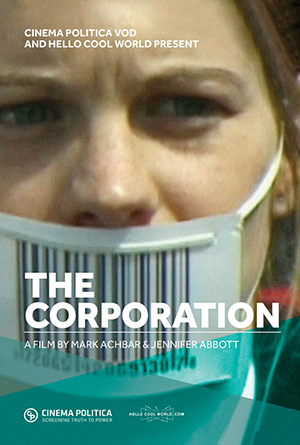 The book was written during the making of THE CORPORATION (co-created with Mark Achbar) and formed the basis of the research and writing for the film. Corporate social responsibility, though sometimes yielding positive results, most often serves to mask the corporation's true character, not to change it. The corporation's unbridled self interest victimizes individuals, the environment, and even shareholders, and can cause corporations to self-destruct, as recent Wall Street scandals reveal. Bakan urges restoration of the corporation's original purpose, to serve the public interest, and calls for re-establishment of democratic control over the institution. Concrete, pragmatic, and realistic reforms are proposed. A groundbreaking book filled with big ideas and fascinating stories, The Corporation is original, provocative and informative. This remarkable film is a resounding requiem for the notion that a corporation's social responsibility is satisfied by maximizing profits for its shareholders. It should be mandatory viewing for every MBA in the USA.